Kim Kardashian Shares Saint West First Photo – Baby Pic Looks Like Dad Kanye West? The very first photo of Saint West is finally here! Kim Kardashian and Kanye West welcomed Saint in to the world in December 2015, and have managed to keep the baby hidden from the public eye – much like they did after his big sister North West was first born. But, today Kim Kardashian finally introduced her baby boy to the world and shared an adorable photo of Saint West sleeping in white PJ’s on her official website. Today is Kim’s later father Robert Kardashian Sr.’s birthday – and that is she chose today to make the big unveiling. Kim captioned the photo of newborn Saint West, “Today is my dad’s birthday. I know there’s nothing more in the world he would have wanted than to meet his grandchildren. So I wanted to share this pic of Saint with you all.” She also posted a photo of her father on her website to commemorate the day, with a sweet little tribute. Obviously the media and other magazines have been salivating over Saint West and making offers left and right to buy photos of the baby – but Kim and Kanye held out until now, to try and lure people to Kim’s website. Kim and Kanye are REALLY trying to make this website happen. It’s the same place that they announced Saint’s birth, in hopes to drive in traffic. Honestly, we don’t really get it – the website is all over the place, doesn’t seem to have any theme other than Kim, and isn’t selling anything or doing paid promotions. Regardless, at least we get to see pictures Saint West for free! Surely it will only be a matter of time before Kim and Kanye find a way to start charging people just to look at their children. 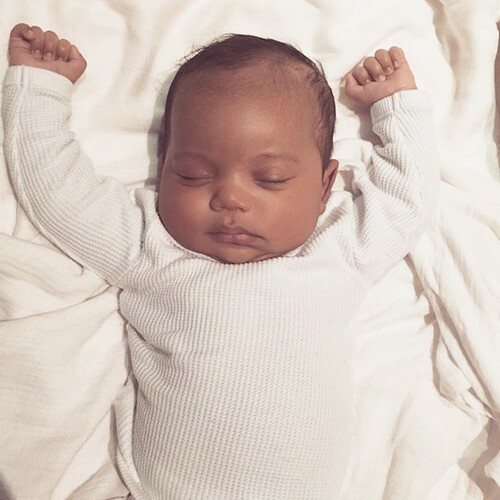 What do you think of baby Saint West? Share your thoughts in the comments below! Saint West Named: Kim Kardashian Names Baby Boy Saint West – Clearly Kanye West’s Choice? Ray J and Princess Love Ridicule Kim Kardashian Saint West Baby Name With New Dog? Baby Saint West Joins Kim Kardashian and Kanye West’s Fine Tradition of Hubris – Can Son Live Up to Name? Kim Kardashian Postpartum Nightmare – Kanye West Obsessed with Saint West – New Parents Fighting Constantly? North West Constant Jealous Meltdowns Over Saint West: Kim Kardashian Consults Therapist?